"The C.H.R. Cheney sign boasted that it sold 'Jewelry and Fancy Goods,' while the adjacent stores sold the Boston Herald, tonic, and ginger beer, and housed J.A. Cutter's Hair Dressing Rooms. The building was located on the eastern side of Main Street. 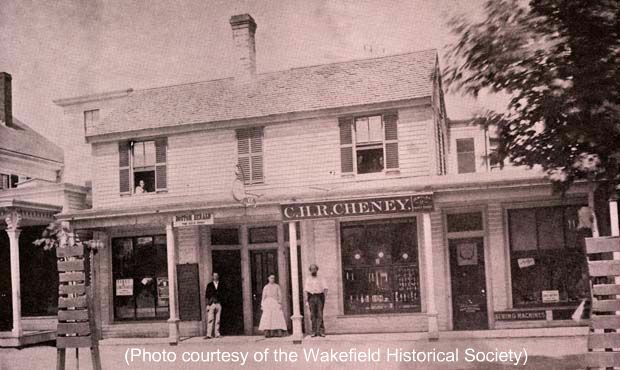 Statistics gathered from 1868 reveal that there were 37 stores in Wakefield to meet the needs of the town's 3200 citizens. Thirty-four of those stores included eight grocery/grain, etc. four dry and fancy goods three clothing, shoes and boots three apothecaries three provisions two fruit and confectionery two furniture two wood, coal and lumber two jewelry one wood and ice one bread one shoe findings one hard and tin ware and one periodicals. The annual business of these stores was reported to be $500,000." -- Text from calendar by Jayne M. D'Onofrio. “Cheney building and store, 1868,” NOBLE Digital Heritage, accessed April 20, 2019, https://digitalheritage.noblenet.org/noble/items/show/6898.